LOS ANGELES (November 4, 2010) – Composer Alan Menken, winner of eight Academy Awards – more than any living person, will receive a star on the Hollywood Walk of Fame on November 10 prior to his new film “Tangled” opening in theatres this Thanksgiving. Menken has created many of the 20th and 21st century’s most memorable film and theatrical music including “The Little Mermaid,” “Beauty and the Beast,” “Aladdin,” “Pocahontas” and “Little Shop of Horrors.” His score and original songs for Walt Disney Pictures’ 50th animated feature can be heard on the soundtrack to be released on November 16 and in the film opening November 24. Menken will be in attendance and honored at an open to the public, star-studded ceremonial unveiling of his star next week in front of Disney’s El Capitan Theatre, site of the premieres of many of his films. The ceremony will be held at 11:30 AM at 6838 Hollywood Boulevard, Hollywood, CA. Mandy Moore (“A Walk To Remember”) voices Rapunzel, a feisty teen with 70 feet of magical hair who is joined by Zachary Levi (“Chuck”) as Flynn Rider and Tony winner Donny Murphy (“The King and I”) as Mother Gothel on the playful soundtrack. The first song written for the film was the “Healing Incantation” sung by Mandy Moore which runs throughout the movie. “Mandy brings that wonderful quality that’s totally compatible with Rapunzel. This voice that’s light, airy, and yearning. She’s adorable, and Rapunzel is adorable.” Moore and Levi perform a duet on “I See The Light,” a sweeping, romantic ballad to make hearts swoon. 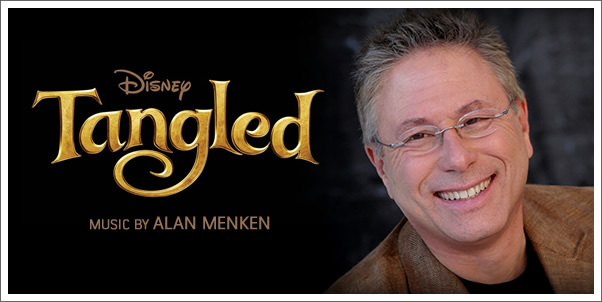 Menken has won four Oscars® for Best Score (“The Little Mermaid,” “Beauty and the Beast,” “Aladdin” and “Pocahontas”) and four Oscars for best song (“Under the Sea,” “Beauty and the Beast,” “A Whole New World” and “Colors of the Wind”). In addition, he has been nominated 18 times, including Best Song nominations for “Mean Green Mother From Outer Space,” “Kiss the Girl,” “Belle,” “Be Our Guest,” “Friend Like Me,” “Go the Distance,” “Happy Working Song,” “So Close” and “That’s How You Know,” plus a Best Score nomination for “The Hunchback of Notre Dame.” He has won ten Grammy Awards® (including Song of the Year for “A Whole New World”), seven Golden Globes®, London’s Evening Standard Award, the Olivier Award and the Outer Critics Circle Award. Other notable achievements include Billboard’s number one single (“A Whole New World”) and number one album (“Pocahontas”), an honorary doctorate in Fine Arts from New York University and induction into the Songwriters Hall of Fame.